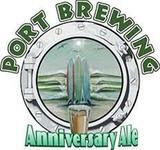 Our massively hopped strong IPA brewed in celebration of our Anniversary each year. Using Columbus, Amarillo and Simcoe hops and dry-hopping with Columbus, Amarillo and Citra, Anniversary Ale has an intensely hoppy body with fresh tones of pine and citrus. A seasonal release that will satisfy any hop-head who has the pleasure to try it. In addition, we don’t want to make people “wait in line” to try an amazing IPA, so we also bottle it!